Figure 7.40.9 illustrates the determination of the tolerable reagent flow variations. A strong acid has been added to water to achieve a pH of 6 and a pH of 2 (curves A and B). The reagent flow (10% NaOH) requirement for each solution is plotted on separate scales (lower and upper abscissas). Assuming a control specification of pH 7.0 ± 0.5, a reagent flow of ±28% variation can be tolerated when the pH of the inlet material is 6.0 (Curve B). 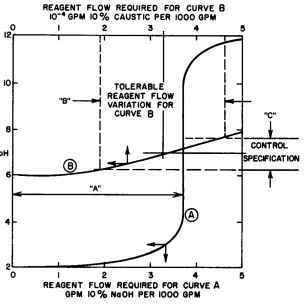 When the pH of the inlet material is 2.0, the tolerable reagent flow variation is ±0.0028% (Curve A) and the problem is 10,000 times more difficult. is opposite that of the equal-percentage valve. This approach is illustrated in Figure 7.40.10. 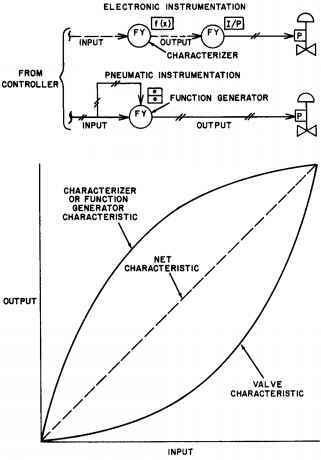 The resultant valve characteristic is approximately linear, which is highly desirable from an automatic control point of view, since the variable gain nature of the process makes the control problem difficult enough. When the rangeability exceeds what can be obtained from a single control valve, a small and a large control valve can be split-ranged and sequenced so the transition point is in the usable throttling range of each valve. 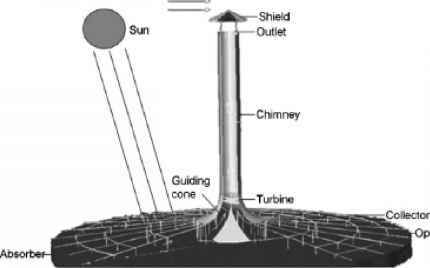 The split-range or switchover point should be chosen to keep the final element gain relatively constant. Equation 7.40(4) calculates the switchover point for the more general case when the split-ranged valves control different types or concentrations of reagents. The split-range computation should be done in the microprocessor-based controller for greater accuracy, flexibility, and standardization of positioner calibrations. This way, separate outputs are created for each valve and displayed on the operator interface. FIG. 7.40.9 Relationship of accuracy and rangeability to ion loading. FIG. 7.40.10 Linearization of equal-percentage valves.